Replaces the old PowerArc 200ST. The new model has digital controls and includes adjustable hot start percentage, hot start time and adjustable arc force percentage. The separate E6010 dinse port is replaced by a panel mounted selection button. Last edited by rustybronco; 12-01-2018 at 09:26 PM. Yes I did. Received it this afternoon. Haven't gotten the chance to weld anything with it yet. Let us know what u think. The power arc 200/300 have a pretty good track record. 2 of their most popular models. I have eyed the 200 ST several times and have recommended it to people that only know how to stick weld and want a decent machine. What I always liked was the auto hot start and arc force. the reason being the weekend warriors I have recommended it to need it to be as simple as possible to use. Now that they are adjustable it probably makes the machine more versatile but also more complicated to use for the guy that does not care for all the adjustability and just wants to weld with it once a month. I wish it had both features, auto and manual adjustment. I still want one for myself though but can not justify it until my Thermal Arc dies, it is 14 years old and still going strong so I may never buy a 200ST. I would not want to replace mine if it could weld with 6010 rod. It is nice that it has lift arc now. Last edited by thegary; 12-02-2018 at 09:56 AM. Just a bit of information I garnered from a label on the carton the welder was shipped in. 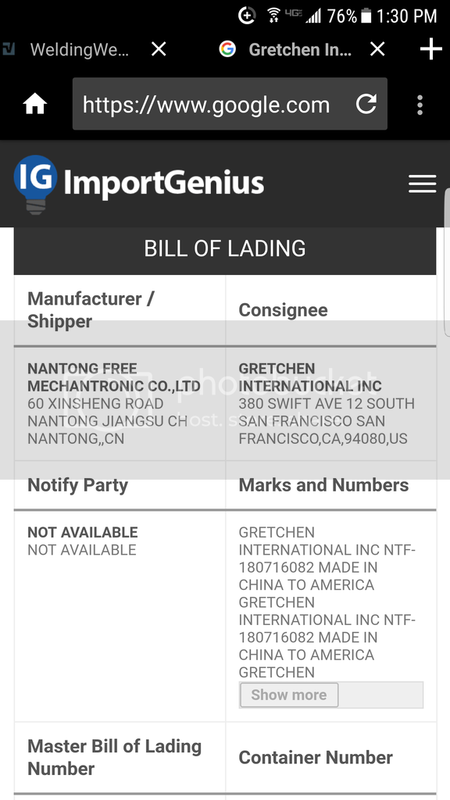 Scroll down to bill of lading. As far those who prefer auto settings over manual mode, they can always set it at 50%, 50% and .5 second on time and call it good until their skills improve. Just my opinion of course. What information? What am I missing on that link? 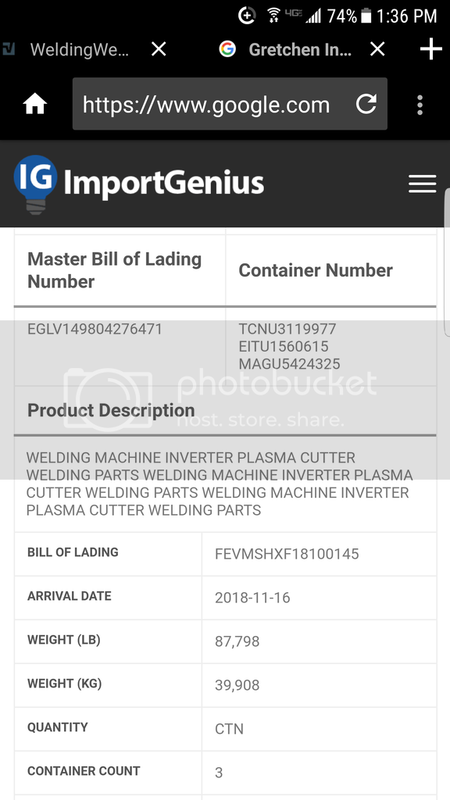 I see no "bill of lading". Last edited by rustybronco; 12-02-2018 at 02:40 PM. Keep in mind for all intents and purposes the only arc welder I've used since High School has been an A.C. buzz box, and not an expensive one at that. What do I think of it? The arc is smoooooth. Hot start and arc force both set at 40% with a .5 second delay, using generic 1/8" E6011 at 75 amps ran a little cold for my tastes. 90 amps was a bit closer. E7018AC (H8) ran well at 120 amps maybe a tiny bit hot as the metal was warm still from the 6011 so I think the currents indicated are within what I've been accustomed to. When I get more time to use it other than just running a few stringer beads I'll get a better feel for the scales accuracy. Personally it's a lot closer than what I've read the 200ST be off by. I don't care for the strap used to carry the machine. Even in it's shortest position it's still too long. As this will eventually reside on a cart as soon as I can make?? one it's a moot point in my book. Others may think it's fine, just a matter of personal opinion I guess. At 30 Lbs it has to be better constructed than the equivalent Amico ST205 (in my book) which they say weighs in at at mear 15 Lbs. The electrode holder is a stoutly made unit and more than adequate for it's intended purpose. The ground clamp appears to be sized for the amperage output but no more. I have a Tweco 300 amp ground clamp if it bugs me too much. The welding cable's size isn't marked anywhere so I pulled the electrode holder off and it measured around .250 making it #4 awg. It also appears the jacket is rubber or something close to it. Very nice job Everlast! All in all a damn nice product. I'm glad I purchased it opposed to the Amico ST205. Couple that with the quality used TIG torch (Weldtec 17V) and flowmeter (Harris/Craftsman) I bought, I think it's performance will exceed anything I could have bought in the same price range. Now to fire up the TIG. That's for another day. Last edited by rustybronco; 12-03-2018 at 02:00 PM. The 200ST has been split out into 2 models with digital control. The old 200ST was analog control. But the heart of both units are designed at keeping in tradition of the older 200 and 200ST units. The 200STL is a great value for those wanting to do TIG and do it with more control and precision. The 200STi is still concentrating on Stick primarily. Both units perform well in that fashion. The introduction of the 200STL has been very well received so far. Been burning metal for several days with this. Thanks for the input on this. 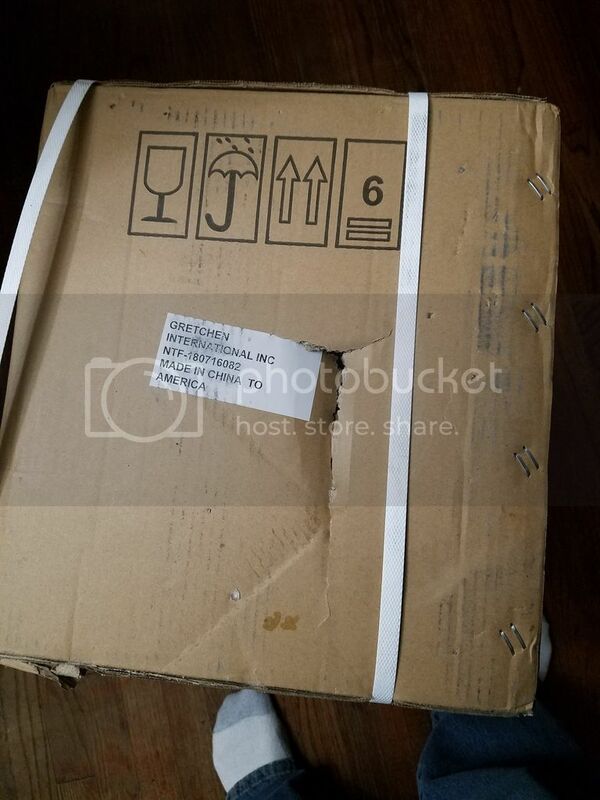 I have been looking local CL for a "buzz box" and cant seem to find anything. So I came across this and have been trying to find as much information on it as I can to see if this would be a good fit to my collection! Andrew, it's a great entry level welder. One other welder they offer you might want to look into if TIG operation is high on your list is the 210STL. It appears to be more orientated towards that function while retaining the 200STi's desirable features like arc force and hot start adjustability. It also has an internal gas solenoid and has the provision to add a foot pedal or a torch switch. The money is a bit more than the 200STi which might be something that needs to be considered if your budget is limited. One thing Everlast has yet to provide on their website is an operators manual for the 200STi, that and a one other model that was promised to be made available three weeks ago. I consider it to be one demerit on their part. Last edited by rustybronco; 01-09-2019 at 12:15 AM. That sounds like something I should definitely look into. Yes I want to get into Tig at some point and a good welder that can do more right now would be good until I decide I want a dedicated TIG machine.